The Frontotemporal Dementia Carer Sessions are open to carers of people with a confirmed diagnosis of Frontotemporal Dementia. The monthly sessions provide information and support to carers in an informal setting. Professionals are also invited on a regular basis to talk about the clinical, social and legal aspects of care. The programme will take place on the last Friday of each calendar month. Please download a programme here for more information. 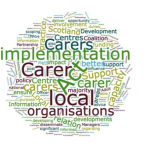 Come along to learn about the Adults with Incapacity (Scotland) Act 2000 and provisions for protecting the welfare of adults who are unable to take decisions for themselves. Planning for the future and assisting the person you care for to make decisions is an important consideration for many carers. 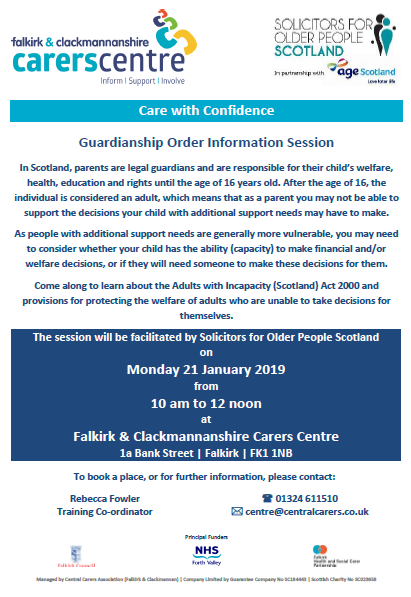 Come along to learn about the Adults with Incapacity (Scotland) Act 2000 and provisions for protecting the welfare of adults who are unable to take decisions for themselves. The session will be facilitated by Solicitors for Older People Scotland who provide support to older people and vulnerable young adults. For more information or to book a place, please contact Rebecca Fowler at the Carers Centre. The new Care with Confidence sessions start on Tuesday 25 September 2018, 10.30 am to 12.30 pm, at the Carers Centre in Falkirk. Hear from various professionals about the services that are available to support carers and those they care for. Topics include Dementia and Sensory Challenges, Social Work Re-ablement Project and Home Fire Safety. Hear from various professionals about the services that are available to support carers and those they care for. 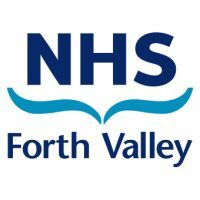 Topics include Dementia – Making your Home more User Friendly, Home Fire Safety, NHS Managed GP Practices and Aspects of Old Alloa.